"This book is a godsend for parents raising kids who have the exciting but often challenging condition called ADHD. 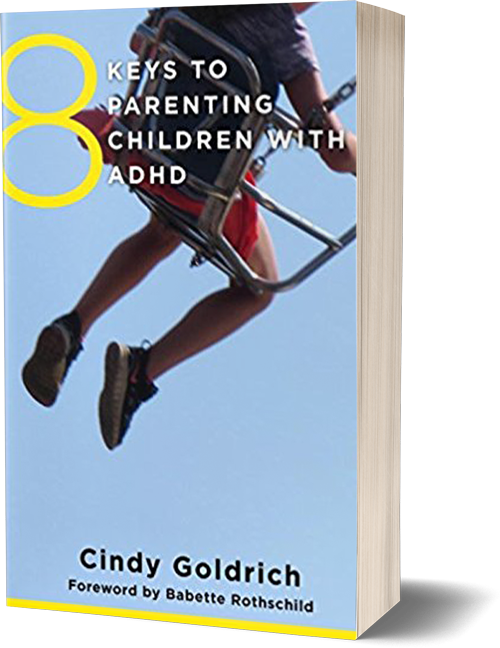 Written by a woman has helped thousands of parents through her enormously successful parenting workshops and classes, Cindy Goldrich's book is an instant classic." Now available for Order from Amazon - in paperback, Kindle, or Audiobook. You struggle knowing if you are supporting or enabling your child each time you consider helping. After all – when is it helpful, and when are you creating a crutch? When are you rescuing, and when are you cushioning the impact of their inherent challenges? You wonder how you can get your child to be more cooperative, organized, motivated, productive, or just ready on time! You have tried love; you have tried logic. Perhaps you have tried rewards and punishments. You should buy this book if…. You are looking for understanding, direction, tools, strategies, and a sustainable way to help your children grow into the best version of themselves. "This is the first book you want to read when navigating your way through the maze of parenting children with ADHD. Cindy Goldrich provides a clear, informative guide filled with valuable tips and tools. She blends her expertise in coaching and parenting to create a book you will use as a resource and a grounding tool from grade school through the teen years. Fantastic!"